Somebody strap me down. I’m about to have a foaming-at-the-mouth episode. The kind only Windows can provide. First, an apology. 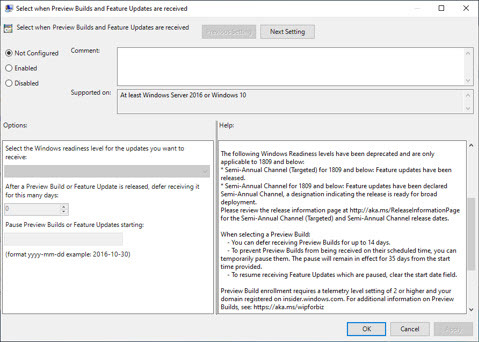 I’ve been very busy swallowing a whale and haven’t looked at the latest beta test builds of Win10 version 1903 — the version that’s due to go RTM any day now. The builds tend to get very boring at this point — all bug fixes and no interesting new features. 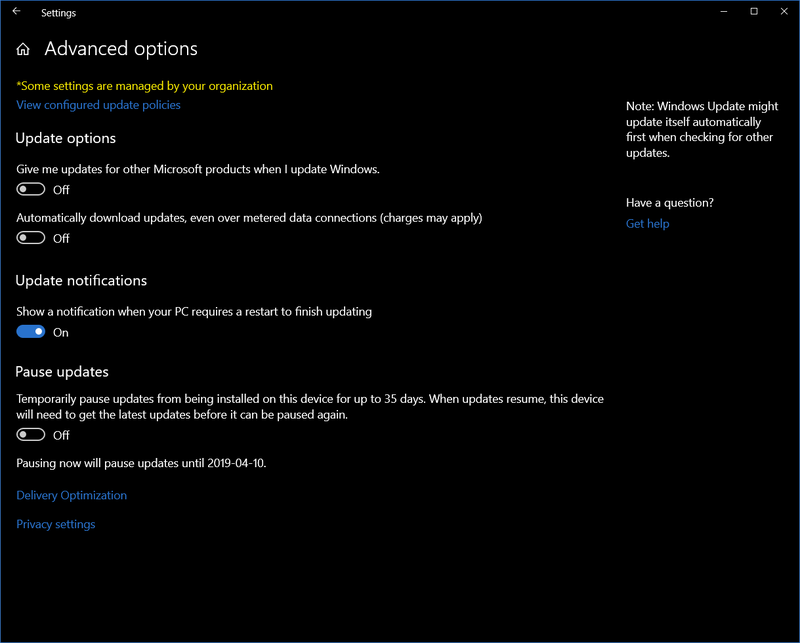 Early this morning, I was looking at Windows Update in the latest beta build of Win10 version 1903 Pro. And I’m about to hit the roof. 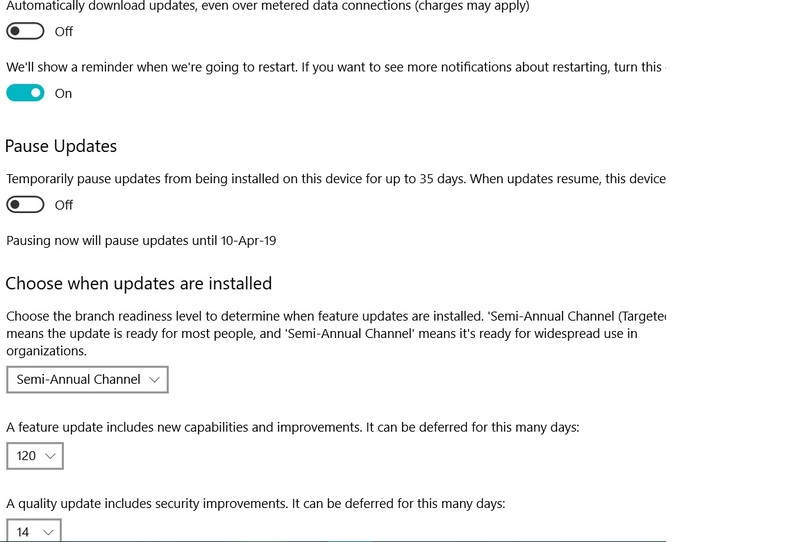 At the time I noted that MS had banished the “Choose when updates are installed” selection, which is where you specify “Semi-Annual Channel (Targeted)” or “Semi-Annual Channel”. That’s how you tell Windows 1809 update to keep its mitts off your machine until a new version is declared Ready for Business. Of course, we know that the terminology has changed, and right now we don’t have any idea when/if Microsoft will ever declare Win10 1809 ready for business. That’s a different can of worms, which Susan Bradley talked about in her Monday AskWoody Plus Newsletter 16.8.0 column. But at least we had the “feature update deferral” setting, which is something. I took that screenshot on Feb. 15. What in the chicken-fired HAIL is going on here? All of the old deferral settings are gone, replaced by a stunted “Pause for 7 days” option. 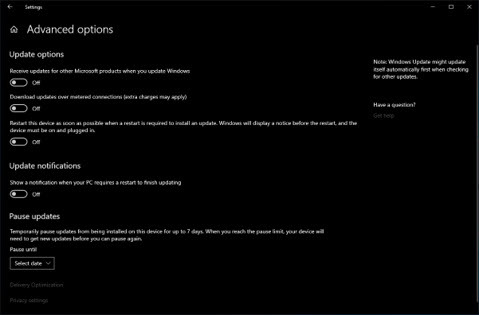 It is now possible—or, will be possible when Windows 10 19H1 ships—on Windows 10 [Home] to pause Windows Updates for 1 to 7 days. Now, unless I missed something obvious (please tell me if I did! 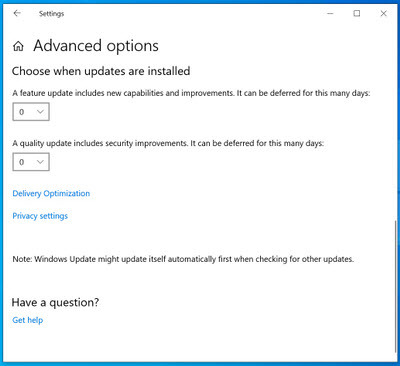 ), it looks like Win10 Pro is going to get this same 7-day Pause Updates fig leaf, and the real settings are only accessible in Group Policy (type gpedit.msc, hit Enter, navigate to Computer Configuration >Administrative Templates > Windows Components > Windows Update > Windows Update for Business). 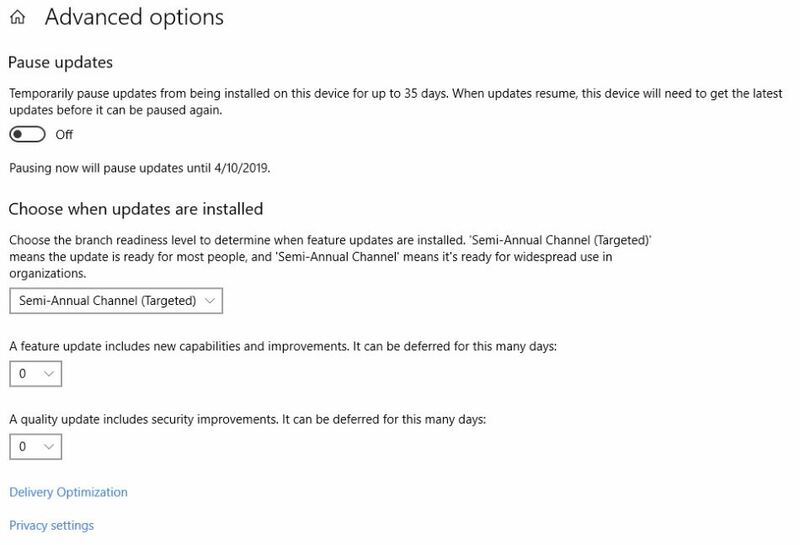 Note that “Semi-Annual Channel” has been neutered — it takes gall to put those settings in a folder called Windows Update for Business — but at least the feature deferral setting is still there. Soooooo…. Is this how 1903 will ship? What happened in the past month? What did I miss? Somebody please help before I start going into paroxysms of Windows Update angst. 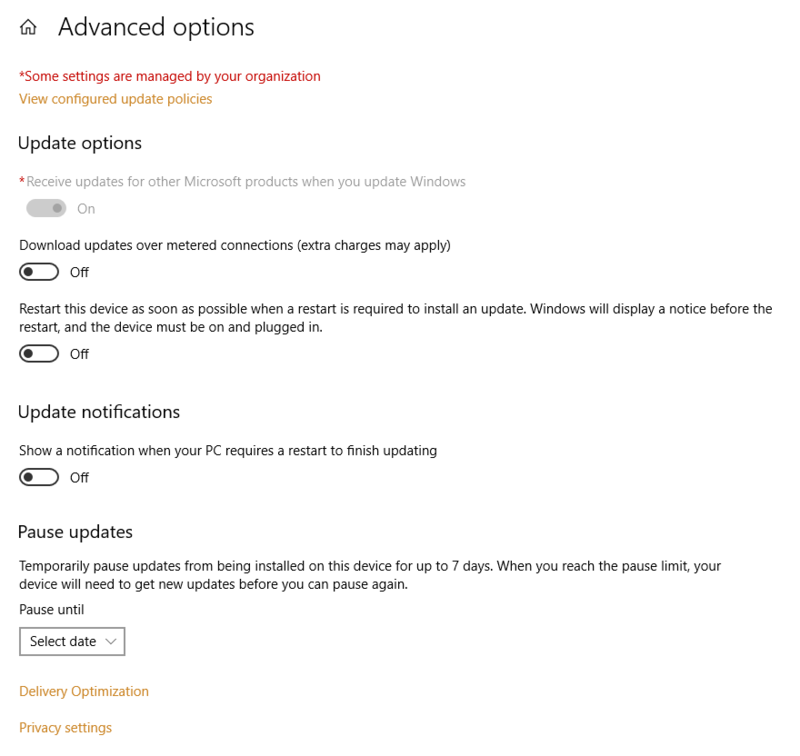 Home › Forums › Win10 1903 Pro Windows Update advanced options — WUH? This topic contains 74 replies, has 26 voices, and was last updated by anonymous 1 month, 2 weeks ago.